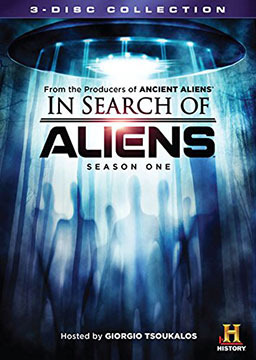 IN SEARCH OF ALIENS follows Ancient Astronaut theorist Giorgio A. Tsoukalos as he explores the world's most ancient mysteries. Highlights from Giorgio's journeys include: “The Hunt for Atlantis,” where investigators attempt to locate the city that Plato described and wonder whether it was home to an advanced civilization that created the human race; and “The Mystery of Loch Ness,” where Giorgio travels from Scotland's Loch Ness to Vermont's Lake Champlain looking for connections between the geology of the two locations and the world-famous yet elusive lake monsters, Nessie and Champ. Includes David Hatcher Childress and Erich von Daniken as guest stars. Episodes are: The Hunt for Atlantis; Nazi Time Travelers; The Mystery of Loch Ness; The Roswell Rock; Searching for Bigfoot; The Mystery of the Cyclops; The Mystery of Puma Punku; The Founding of America; The Mystery of Nazca; The Alien Code. Ten episodes from the spin-off of Ancient Aliens packed onto 3 DVDs.